Source: CICH graphic created using data from the Survey of Young Canadians 2010/2011, Statistics Canada- Custom runs. 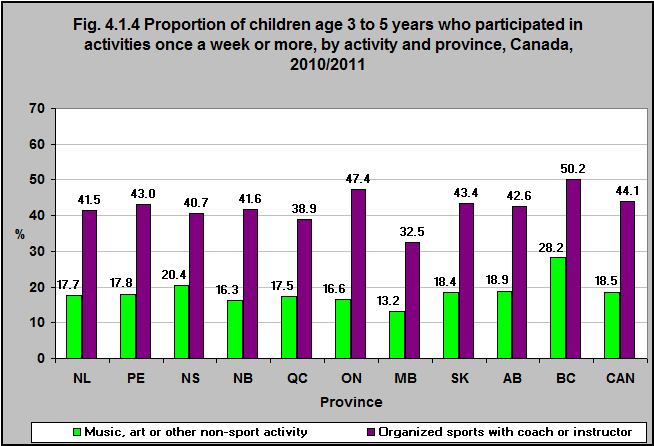 There are differences in children’s participation in organized activities depending on the province in which they live. In 2010/11, fifty percent of 3 to 5 year-olds in British Columbia took part in sports with a coach or instructor (except dance, gymnastics or martial arts) once per week or more. That compares with 33% in Manitoba. Twenty-eight percent participated in music, art or other non-sport activity or clubs/groups in British Columbia, compared with 13% in Manitoba.